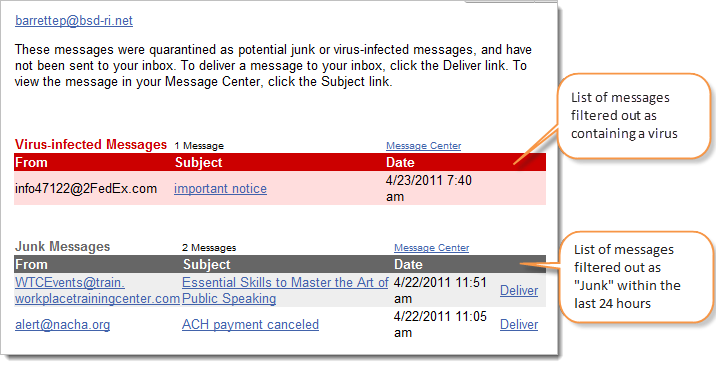 As part of staff members' access to your Postini Message Center to view your email SPAM and archive, you will now receive a Daily Quarantine Summary that lists any messages that were categorized as "Junk" within the last 24 hours. The purpose of this Daily Summary is simply to show you what messages were filtered out by Postini and did not reach your Gmail Inbox. You do not necessarily need to do anything or take any action when you receive the Daily Summary. Here is what a Daily Quarantine Summary looks like and what the different sections mean. If you see messages that you think might have been incorrectly categorized and filtered by Postini, you can choose to deliver individual "Junk" messages to your Gmail Inbox or read them within your Postini Message Center before making that decision.